I’ve been hearing rumors that Starbucks has done a complete overhaul of their pastries and that, my friends, makes me sad. I love cupcakes and cake pops (lies) as much as the next person, but who wants that with coffee? Hey Starbucks, quit trying to keep up with the trends and stick with things that go with coffee… like uhh, coffee cake. 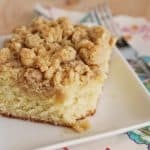 This coffee cake is a lot like one of my favorite Starbucks pastries, the New York Style Coffee Cake. Except I think Starbucks calls (called?) it crumb cake. Or I called it crumb cake. Once of us definitely called it crumb cake. The cake is so soft thanks to the yogurt in the recipe. And by the way, I used honey flavored Greek yogurt in this and it turned out fantastic. If you have some in your fridge, use it for this cake! The crumb topping is unbelievable. I could have eaten the entire recipe of crumb topping by itself. If you’re into nuts, I think you could get away with tossing some finely chopped walnuts or pecans into the topping too. Preheat the oven to 350 degrees. Butter the sides and bottom of a glass 9Ã—13 pan. You can use a metal pan, but the edges may get a bit crispy. To make the crumb topping, mix both sugars, salt, and cinnamon in a medium bowl. Add the melted butter and whisk until combined. Fold in the flour until it is absorbed. Spread out a large sheet of parchment paper on the counter and spread this mixture out on the parchment paper to dry while you make the cake mixture. To make the cake, sift the flour, baking powder, baking soda, and salt together in a medium bowl and set aside. Cream the butter until it is smooth and ribbon-like in the bowl of a stand mixer fitted with the paddle. Scrape down the bowl and add the sugar. Beat until fluffy. Add the eggs, one at a time, and beat until incorporated. Scrape the bowl and mix again for 30 seconds. Add the yogurt and vanilla and beat just until incorporated. Add the dry ingredients in three parts, scraping down the bowl before each addition, beating only until it is just incorporated. To assemble the cake, pour the batter in the prepared pan. Use your hands to scoop up a handful of the topping and make a fist. The topping should hold together. Break off in chunks and drop them over the cake. Repeat to use all the topping. Remember, the topping layer will look very thick. Bake the cake for 45 to 55 minutes, or until a toothpick inserted in the middle comes out clean. Rotate the pan two times during the baking process. Cool the entire pan on a wire rack for 30 minutes before serving. The cake will last for 3 days, tightly covered, at room temperature. 32 Responses to "New York Style Coffee Cake"
Love this! Can’t wait to try it. I adore coffee cake and am never truly happy with the ones I make. Thanks! This looks like the perfect gift for my Starbucks-obsessed friend! Thanks for sharing! I run a Starbucks, the coffee cake is still available for purchase. The cake pops are intended for kids or people looking for a smaller treat. YUM! I love anything with a crumb topping. Mmmmm coffee cake rarely lasts long around here. I’m all about coffee cake but I always worry that the “cake” part is so boring and the topping is the only good part…I don’t think that’s the case with this one though! Must make! I totally agree with you! Give me a piece of coffee cake or pumpkin loaf over a cupcake or cake pop! This recipe looks great! This won’t last long in our house. I love crumb topping on anything! And on this cake? Yes please! I’d heard that about Starbucks too but my co-worker buys lunch there pretty much every day and says he can’t tell a difference. I’ve been itching to try this recipe. It looks great. I agree- if you call yourself a coffee shop you’ve got to have coffee cake! Love coffeecake, just don’t love coffee. Gonna buy some yogurt and make this one this weekend. This cake looks so soft and crunchy. Just how I like it. bookmarked! I love the crunchy the brown sugar and the cinnamon! With a cafÃ© latte it’s incredible… I’m sure. This is the next recipe for Baked Sunday Mornings and it was awesome! You should join us! Yum, I love the big chunks for the topping! I can’t wait to try…especially since it has the name “New York” in the title. It must be good! 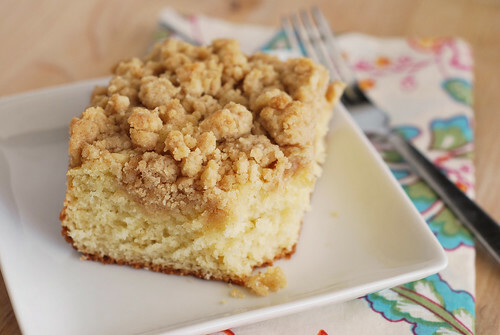 Your crumb cake looks delish and those big chunks of goodness really seal the deal. I can’t wait to try this and have a bite! I’m sure this will be another blockbuster recipe! Thanks! This tasted OK but was not really worth all of the trouble it took to make it. I’ve made this recipe more than 5 times already. And it’s always good. I LOVE yogurt so this is now my go to coffee cake. I’ve added chocolate chips to the batter for a more desserty cake, and it’s great! 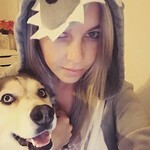 Hi, I absolutely love your blog…it is sensational. Could you please tell me if I can use Greek Yogurt in this recipe? Hi, I am not sure what happened to my comment but it somehow disappeared. Could you please tell me if you can use Greek Yogurt in this recipe? Can I use regular vanilla yogurt? Yeah, I think it would be fine. Love love love! I will need this come the weekend.